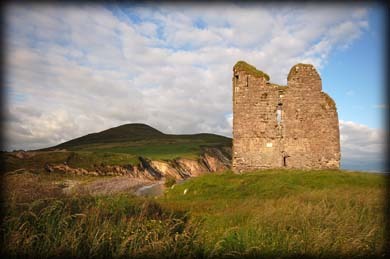 Sitting prominently on a hill overlooking a gorgeous little bay with views across the Irish Sea to the Iveragh Peninsula, Minard castle commands your attention. 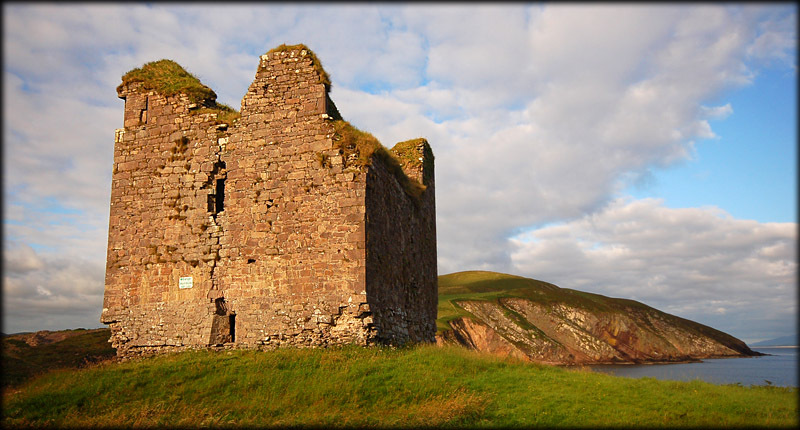 It is one of only three of the mid-16th century Fitzgerald castles built on Dingle Peninsula (Rahinnane and Gallarus being the other two) with substantial remains. Although we arrived at high tide and the sandy beach was submerged, we were amazed by the large boulder beach, the boulders having been rounded by rolling on the sea floor and then thrown up by the sea during storms. This natural storm beach is considered one of the finest in Ireland. 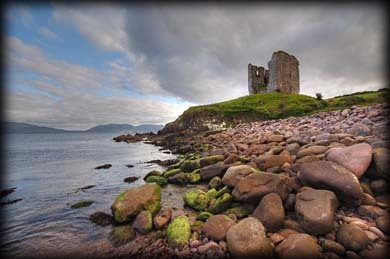 The castle ruins consist of a rectangular tower house constructed from roughly dressed sandstone blocks laid in a strong mortar. Three stories of the castle survive, but it is believed that there was a 4th story or attic space above those. The first & second stories were vaulted. The strength of this castle was demonstrated when in 1650 Cromwell's Army detonated charges at each of it’s corners yet the castle still stood. However, all occupants of the castle were subsequently killed and the structural damage done made the building uninhabitable. What is most striking about this castle is the fantastic location which made it a highlight of our exploration of Dingle Peninsula. Situated: Very easy. 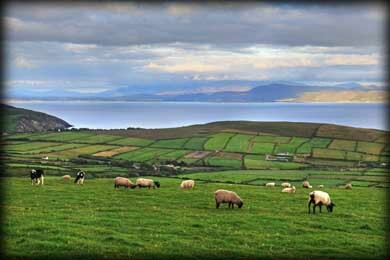 From Dingle town take the N86 east for approx 8 kilometres to Lispole. 2 kilometres after Lispole take a right turn to Minard. This road takes you down to the beach. Discovery Map 70: V 5548 9921. Last visit July 2011.